I often compare the first day of the month to the last day. And I’m again doing this. February 1 was darker and colder than February 28, which is lighter and warmer. There were no moose sightings on February 1, there were several on February 28th. February 1 was windy. February 28 is breezy. 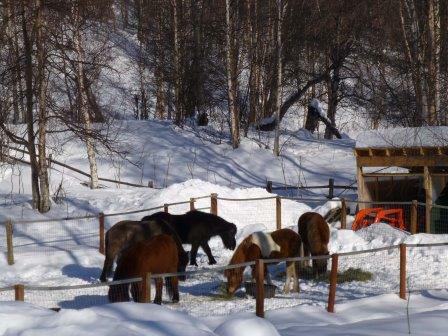 February 1, the horses were milling about in the cold. February 28, the horses are laying about in the sun. February 1, it was dark when I came home from yoga class. February 28, it was light when I came home from yoga class. grass sprigs appearing here and there. And Pete will take Siggi and I will take the rest down to the roadside and we’ll hand graze them. And soon, well somewhat soon, the trails will again be ride able. In the meantime, I’m enjoying the flip side of winter. Pete went to work. I next rode Signy and ponied Raudi, who was a tad bit sluggish today. So I made it a short trip. Then I rode Tinni and ponied Signy. Taking all these horses out, repeatedly, is a lot of work. I’m not going to elaborate on the time spent cleaning up after five of them; suffice to say, I now spend more time scooping poop than I do riding. And when I fall behind on the cleanup, I really fall behind. But this is all good work. There’s an upside to this, and this is that I get to be with a whole bunch of really agreeable animals. It’s the stuff good dreams are made of.